FREE to join.. Sign up today. Get new home remedies and natural health tips each week. 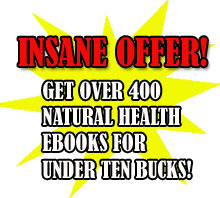 All subscribers get one FREE natural health ebook sent to them each and every week for close to a whole year! We respect your privacy and ensure email confidentiality. We will never spam or give you useless information. You will only get the very best of content we consider worthy. That means interesting news from within the natural health industry, and all sorts of new and wonderful home remedies and anything else of value we think will be positively useful for you as a fellow natural health and home remedies enthusiast. I hope to enjoy and benefit from your news letters.